This highly sought after route takes a direct line up the central pillar of Mount Barrill’s East Face. It somewhat resembles a cobra from certain aspects. While most really big routes in the Gorge are generally a horror show only attempted by the world’s best climbers, this route is manageable by more mortal seasoned alpine rock climbers. Much of the rock on the Cobra Pillar is clean, solid, and enjoyable, but there is the occasional section of what makes the Gorge famous—the Cracker Jack gravel that you can literally chop steps in with your ice-tool. 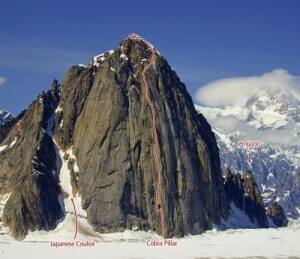 The combination of easy access and straightforward descent makes the Cobra Pillar a great all-around alpine route. Which SuperTopo guidebooks include a topo for Cobra Pillar?